When your keyboard setup is ample, try the tray that's big enough to handle housing your keys and mouse platforms on a single surface with the Humanscale 400 Diagonal Big Keyboard Tray. The 400 board stores everything on your work surface instead of needing a separate a mousing platform - allowing you to keep your mouse at the same tilt as your keyboard. 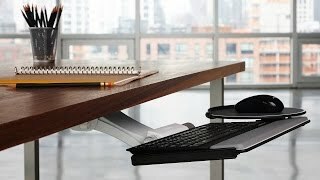 And not only is the tray spacious, it fits the angled edges of a diagonal corner, letting you install an ergonomic keyboard tray on trickier desk setups. The Humanscale 400 is available with a Design Your Own option for more customized typing, your way. The Humanscale 400 Diagonal Big Keyboard Tray is only available in Black. Select one of the foam or gel palm rest options for the 400 Diagonal Big keyboard platform. Choose a solid 27'' palm rest or a split palm rest with one 20'' section and one 7'' long section; this feature comes in handy if a user doesn't always want a palm rest in front of their mouse or keypad (pictured in main image above). Both types of palm supports are covered with an easy to clean, black synthetic leather. Slim 19'' gel palm rests are also available for users with thin keyboards such as those made by Apple. The slim gel palm rests are available in silver or black, but will not sit flush against the corner of the keyboard tray like the 27'' or 20'' palm rests. The slim 19'' palm rests will sit roughly 5/8'' away from the closest corner when installed. When designing your Humanscale 400 Diagonal Big Keyboard Tray, if you choose to not add a palm support, there will be two holes located at the installation points on the tray. A separate mouse platform is not available as this keyboard tray is large enough to support mousing on the main platform. A mouse pad for the separate mouse platform is not available as this keyboard tray is large enough to support mousing on the main platform. I bought his product because it would be installed in a corner of a L-shaped desk and the length of the track... I didn't want a palm rest and almost returned the product because of of holes in the tray where the palm rest is installed. The picture shown should be displayed with the choices that are made so buyer understands what it will look like... I wrapped vinyl paper over the holes, hopefully I'll not regret returning this. It works well, easy to adjust, but it responds to my typing more, than i expected. Also for the price I would expect more elegant appearance than it actually is - kinda constructivistic. $254.00 List Price: $390.00* The list price is the same as the MSRP (Manufacturer's Suggested Retail Price). It may not necessarily be the price at which the product is sold.